Although high-intensity resistance training increases central arterial stiffness, moderate-intensity resistance training does not. However, the effects of low-intensity resistance training on arterial stiffness are unknown. 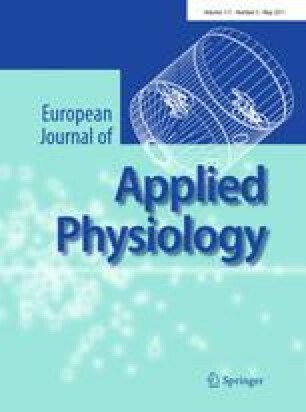 The aim of this study was to investigate the effect of low-intensity resistance training with short inter-set rest period (LSR) on arterial stiffness. Twenty-six young healthy subjects were randomly assigned to training (10 males, 3 females) and control groups (9 males, 4 females). The subjects performed LSR twice a week at 50% of one repetition maximum for 10 weeks. Training consisted of five sets of ten repetitions with an inter-set rest period of 30 s. Changes in brachial-ankle pulse wave velocity (baPWV) and brachial flow-mediated dilation (FMD) were assessed before and after the intervention period. After the intervention period, one repetition maximum strength increased (by 9–38%, P < 0.05 to <0.001; increases varied among the exercise types), baPWV decreased (from 1,093 ± 148 to 1,020 ± 128 cm/s, P < 0.05), and brachial FMD increased (from 9.7 ± 1.3 to 11.8 ± 1.9%, P < 0.05). These values did not change in the control group. These results suggest that LSR reduced arterial stiffness and improved vascular endothelial function. This research was supported by the Grant-in-Aid for Scientists Research from the Ministry of Education, Culture, Sports, Science and Technology of Japan (21700680).